There’s a local farmer who sells monthly meat boxes through co-ops and at the farmers market. Even though it’s a bit pricey, I love it because I can buy a box and get a variety of pork, beef, lamb, and eggs and not have to think about it too much! One of the items that’s been sitting in my freezer is something called English Roast. I wasn’t really sure what it was, but thanks to my friend Google I discovered it’s perfect for pot roast. Which is great, because this time of year I LOVE to use my slow cooker! 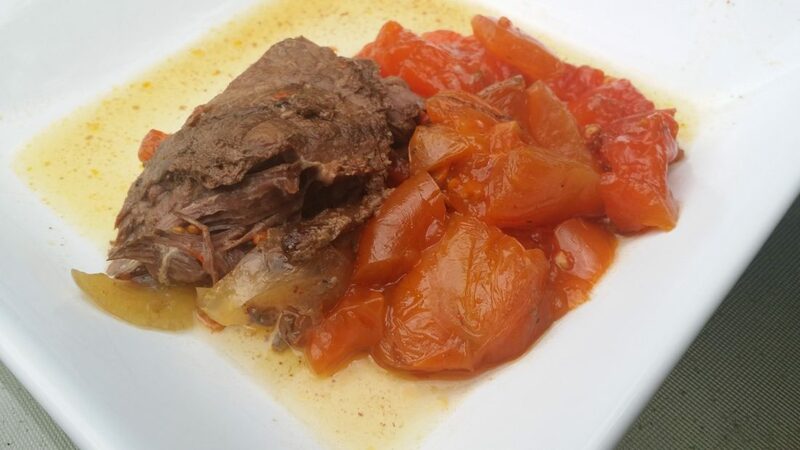 Again thanks to my friend Google, I came across a delicious recipe for Spiced Slow Cooker Pot Roast with Tomatoes from Life’s Ambrosia. With a few tweaks here and there it turned out to be a very flavorful and simple treatment for the English roast that had been sitting in my freezer. Combine the spices and rub all over the roast. You can sear the roast before adding it to the slow cooker but honestly, I’ve never been able to tell the difference and since I’m usually not quite awake in the morning when I put things in the slow cooker I usually skip this step. I also really, really like to use a slow cooker liner (which is probably bad because of the plastic but we choose our battles). Place onion on the bottom of the slow cooker, roast on top, and then pour the remaining ingredients over top of that. About 8 hours later it’s done! You can remove the tomatoes, onions, and some of the juice and reduce it down to make a sort of tomato gravy, but DH and I were starving so we skipped that step and just ate the tomatoes alongside the roast. The Verdict: It was delicious! I love how it makes the whole house smell warm and cozy. Sometimes roasts can turn out kind of bland, but the spices really took this up a notch. DH approved it as well. We love a roast li,e this once the cooler weather hits! Looks delish! Thank you, and nice to meet you through Sunday Supper! That is a great idea with the meat box. I also love your recipe with all the amazing spices, nicely done! It really is a lifesaver with busy weekends! I thought weekends were supposed to be less busy, not more! I am a HUGE fan of cooking with lots of spices/herbs. Life is too short for bland. Me too, other nights it’s eggs or ground beef something! I always use an english cut chuck roast when I make roasts! They cook up so tender! I don’t think I’ve ever cooked and English roast, but I won’t hesitate to buy one now! Your pot roast looks perfect!!! thanks! I had never cooked one either 🙂 It was quite tasty. We love getting our slow cooker out in the winter. This looks like a perfect roast! thank you, I agree that when the weather gets colder it’s time to break out the crock pot! This looks wonderful and I love the addition of spices! I am obsessed with my slow cooker, and this roast looks absolutely AMAZING!! I can’t wait to try this recipe. This roast looks delicious. I can only imagine the aroma in your house from it! Love your story. I’m from SE Michigan – nice to (virtually) meet you! Pot roast is one of my favorites. Easy peasy and delicious, especially if you use a slow cooker. Ooh, I’ve never looked into a monthly meat box before. Will have to see if there is something similar in my area. My 1/4 cow stash is almost gone. Your roast looks absolutely delicious. Love the pairing with the tomatoes. thanks! There are actually a couple of meat CSAs in my area. But getting 1/4 cow is a great idea! DH hunts for deer so we often use that in place of beef. Love the ease of making this very comforting dish in a slow cooker! I love my slow cooker AND I love roast!! Definitely adding this to my next week’s meal planner! !